As we pause this morning to remember where we were eight years ago when our country was attacked, let us remember Port Authority Officer Joseph M. Navas, who truly lived Jesus’ commandment. After graduating from Paramus High School in 1975, Navas followed in his father’s footsteps working for the Port Authority, ultimately becoming a member of the Port Authority Police Academy Class of 1985. After graduation he worked at Newark International Airport, followed by the Authority’s central police pool. In 1994 Navas joined the Port Authority’s Emergency Services Unit at Journal Square where he trained for specialized high-risk rescues in rescue diving, confined space repelling, and chemical and biological counter-terrorism. On the morning of Sept 11, 2001, Officer Navas, was summoned to the World Trade Center towers. He was last seen leading other emergency service officers into the North Tower. Curt Kellinger, from the Port Authority Police Command noted "The last we heard he was on the 66th floor. That was the last transmission. The 66th floor." When the World Trade Center towers fell, Navas and thirty-six Port Authority officers were among those killed. His body was never recovered. His family and friends celebrated his life with a Memorial Mass at the Roman Catholic Church of the Annunciation in Paramus, NJ. As we remember Joseph Michael Navas and the many others who lost their lives in the 9-11 attack on the United States, let us call to mind the words prayed by Pope Benedict XVI during his visit to Ground Zero last year. 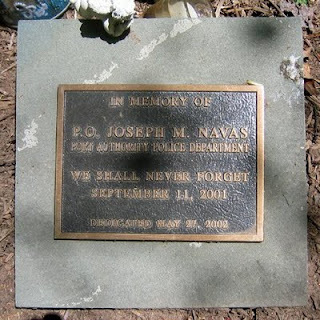 Shelly, Thank you so much for taking the time to write such a lovely tribute for Joseph M. Navas. Never forget. Shelly, a moving and thoughtful tribute to Joseph Navas--thank you. What a beautiful tribute. Thank you. Thank you for writing the tribute to my brother born February 12, 1957. He was very special and is missed each day, RIP Joey, I'll love you always!